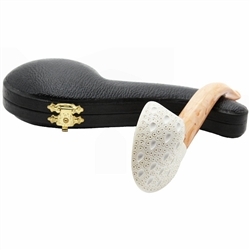 Hand Carved Freeform Lattice Meerschaum Pipe - Interestingly shaped pipe bowl may be of a flying saucer landing out of control, or perhaps it is a mushroom growing sideways. Use your imagination with this lightweight small bowl pipe that is carved in teardrop lattice leading into a smooth shank. The bent stem is a very light color. Definitely a pipe that is a conversational piece.